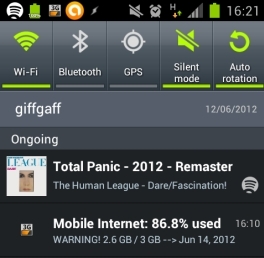 The Spotify update for Ice Cream Sandwich came out of preview today – get the update (0.5.0) from the Play store. It’s a huge improvement over the previous released version, so you’ll definitely want to upgrade (no matter what version of Android you use). I reviewed the preview version of this update already, so here’s a look at what’s changed since then. 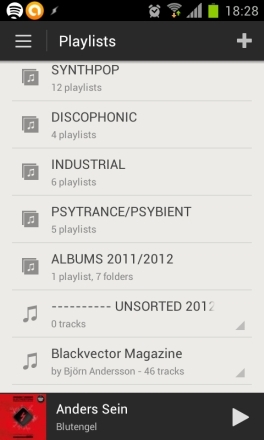 The biggest new feature for me is Playlist Folders – finally on Android! These work just as you’d expect: click a folder name (which also tells you how many playlists the folder contains) to open the folder. You can use the back button as a way to navigate back through nested folders if you have folders-within-folders. You can’t create a folder (you do that with the desktop app) and the Downloaded section is still a flat list. Playlist folders also have a handy "All Tracks" option to play all tracks in all playlists. The widget is back, now sporting a Spotify green go-faster stripe along the bottom. Functionally it’s the same as before, with the standard playback controls and album art icon. 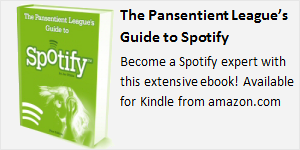 Click the widget's album art to jump back into Spotify. 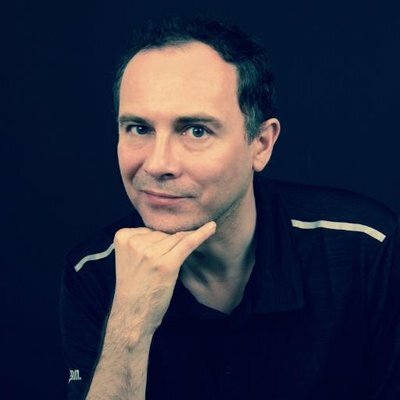 Scrobbling is back and works as expected: Last.fm reports each song as “Scrobbling from Spotify Mobile” as soon as a new song starts playing. Note that you need to press Enter when putting in your Last.fm password, otherwise it won’t be saved. Also new is a crossfade feature as seen on the desktop and iPad app. This lets you set a crossfade between tracks of 0 – 12 seconds. My preference is to set this at around 7 seconds. Gapless playback was available in the preview, but this version now gives you the option to switch it off. 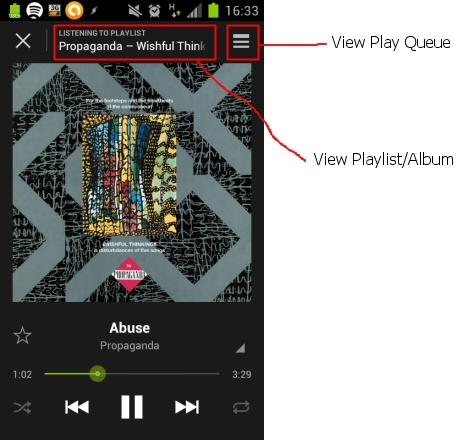 The Play Queue returns: click the bars top-right from the Now Playing screen to display it. This lists songs coming up in the queue (and shows album art for each track – nice!) but doesn’t show the queue’s history unfortunately. 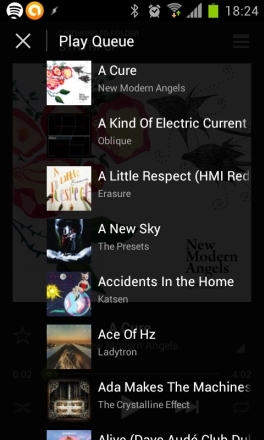 After missing album art from the Android app for so long, it's now everywhere! The currently-playing screen now displays the name of the playlist or album you’re listening to, which you can now click on to view the playlist/album. The Spotify icon in the notification area has had a bit of a monochrome makeover, and you’ll also see album art if you pull down the notification area while listening to something. “Under the hood” it seems more stable than the preview version: I’m glad to see I no longer have to kill the app several times a day to get it going again. The notification area now shows album art. This app has been completely rewritten to add a pile of new features, but inevitably some features from the old version didn’t make it. You don’t seem to be able to set the storage location, making your microSD cards useless for Spotify. There’s no Library any more, meaning that you can’t play all your songs at once (on shuffle or whatever). There doesn’t seem to be any local files option (unless you add them to a playlist on the desktop then “download” them on the Android app) and you can’t clear the download cache in-app any more. Oh, and there’s no Exit option or support for Landscape mode. Based on the previous released version, this update is a huge improvement. It IS slicker and it IS faster. But since it’s a complete rewrite it does also introduce a few new glitches and problems. The bonkers design of duplicating all your downloaded playlists in a long flat list before you can get to your folders seriously reduces the app’s usability, and I’ve had more “Spotify is offline” errors today than I’ve ever seen before. But these are the kind of bug that should be easily fixed; all things as they are, I’m very pleased with this update!